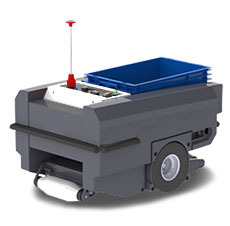 The TM-100 is an out-of-the-box robotic solution that streamlines warehouse order fulfillment processes. The system combines real-time work tracking to dynamically adjust for order volume, shipping priority and seamless collaboration with warehouse staff. 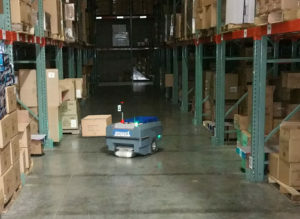 The TM-100 system optimizes both human and robotic workers, using real-time monitoring and fault detection to improve delivery time and reduce incorrectly picked items. Paired with a quick return on investment, it’s all good news for your bottom line. The TM-100 is designed to recognize humans and other obstacles in its path. It is courteous enough to stop to give way to people and smart enough find a way around obstacles. The TM-100 is built to handle normal warehouse conditions; obstacles, dirt, dust and temperature extremes are all in a days work. Of course with its rugged industrial design, uneven floors, bumps and dropped items are no big deal either. Robots working with Androids (…and iOS and Windows). Our intuitive app has a simple interface that error-proofs the picking process. It guides the picker to an aisle and zone for an accurate next pick and placement into the tote. It is customizable to include the data elements you would like to see. And of course, it’s available for Android, iOS and Windows mobile platforms. As flexible as a robot can be. The TM-100 fits easily with your existing infrastructure. It integrates easily with your WMS, works in warehouses with mezzanines and requires minimal training to use. If you’d like to learn more or see a live demo, please contact us.